Knock Out Collars & Plugs | Global Elastomeric Products, Inc. Without proper control over the fluids in your wells and rigs, the process of meeting productivity quotas, as well as maintaining a safe working environment, can be an insurmountable challenge. But with the right knockout collars and plugs, the control you have over the pipe you’ve placed in the ground — as well as the fluids contained in your well — significantly increases. The use of high-quality knockout collars is a must for any responsible foreman and crew when avoiding control problems and unnecessary accidents. The good news is that at Global Elastomeric Products, Inc., we’ve been manufacturing high-quality equipment — such as drilling machine parts, well casings, knockout collars and plugs — for more than five decades. If you’ve had enough of low quality materials, lengthy delivery schedules and overpriced parts, know that there’s a better way to get the oilfield products you need. At Global EEE, we’ll work with you to ensure quick turnaround times and high-quality products on every order you place. Plus, since our sales team has more than 100 years of combined hands-on “Oil Patch” experience, you can count on our customer service to be among the best you’ll find anywhere. Knock out collars are used to balance fluid levels within the tubing strings. They allow for the releasing/non releasing of fluid within the string. A plug is just that, a plug within the K-O Collar. Our knock-out collars come with and without special stops. Our wide selection of knockout collars includes sizes ranging from 2 3/8” to 3 1/2” — both with and without special stops. 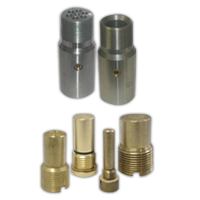 In addition, our replacement knockout plugs are made from durable brass and come in 1/4”, 3/4” and 1” sizes. When a foreman would like to release fluids from the tubing string they will send a bar through the string that will punch the plug from the collar. Knock out collars with special stops allow you to catch the bar as it descends through the collar. A Knock out without the special stop will allow the bar to shoot straight through the collar and further into the tubing string. We’ve been providing American-made, high-quality products to the oil and gas industry since 1963. If you don’t see the part you need on our product pages, don’t worry. Our in-house design and engineering team has the expertise to meet all your custom element needs. Call us at 661-831-5380, and we’ll walk you through our custom manufacturing process. To learn more about our knockout collars and plugs, contact us today for a no-obligation quote.